Heinz Scharlibbe looks at a new modular electronics housing system which provides a home for individual electronics solutions destined for applications in industry, process automation and building technology. Weidmüller is introducing a newly developed, modular electronics housing system to the market in the form of its IP20 rated CH20M. CH20M encloses individual electronics assemblies for installation in electrical cabinets or distribution systems. These electronics housings are simply snapped onto TS 35 top-hat rails. CH20M stands for 'Component Housing IP20 Modular' and offers efficiency and innovative design in equal measure for production and applications. The new housing standard for electronics components combines standardisation with versatility - in a manner of speaking, the customer receives a 'tailor-made suit with off-the-peg convenience'. Weidmüller's modular housing concept facilitates a highly individual design - tailored to meet the customer's requirements - extremely functional, efficient and optimised for cost effectiveness. Then there is the scalability of the housing series - at the present time a 6.0mm wide SlimLine housing and a 22.5mm wide module are available ex works. The housing series will be continually extended. The 22.5mm housing not only offers sufficient space for electronics assemblies but large operating and display surfaces as well. The SlimLine housing has been designed with four connection levels and a total of eight connections. The compact 22.5mm wide housing is equipped with up to three connection levels - each fitted with a release frame. It has been designed for reliability, a point underlined by a leading contact for reliable separation of the connection and a captive coding system. The transparent top cover can be removed, printed with individual markings or even sealed - to protect the operating and display elements. Optionally available pin headers are suitable for SMT/THR reflow technology and can be supplied packaged ready for automatic placement. With every square millimetre of the 7400mm2 PCB board available for use, the placement area is very generously dimensioned. The CH20M offers the manufacturer the advantage that the housing can be tailored exactly to suit his application and not the other way round. 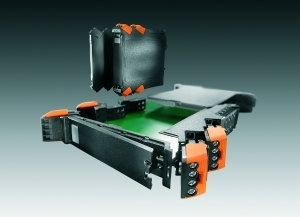 Weidmüller's new CH20M (Component Housing IP20 Modular) accommodates individual, powerful electronics assemblies and components. From the point of view of technology and design, Weidmüller's design engineers have developed a fundamentally new housing concept that sets new standards both in production and in use in applications. In fulfilling existing and future user requirements for innovative 'packaging' of just such electronics components, the CH20M housing series addresses users seeking solutions in industry and process automation as well as building technology. 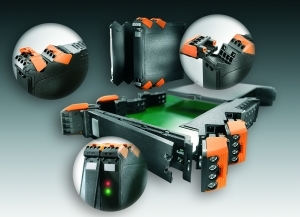 The housing series CH20M has been designed as a compact, modular electronics housing system for individual electronics solutions requiring IP20 protection. tilising Weidmüller's CH20M enables manufacturers to encase their functional assemblies for installation on TS 35 top-hat rails in electrical cabinets and distributions systems. Presently available are the 6mm SlimLine housing and the 22.5mm wide module housing. The installation depth is 115 mm, the installation height 105mm. The housing series will be scalable and continually extended. The 6mm housing is equipped with eight connection elements. The connection technology utilised is the clamping yoke (screw) - this having proven its reliability millions of times over. 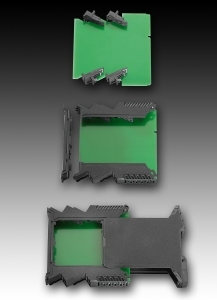 Modularity forms the basis for the flexible housing concept of the 22.5mm module; this includes a varicoloured connection section for unambiguous allocation of functions, optional FE and PE connections as well as variable side panels. Different fronts offer variability in design, function and depths. 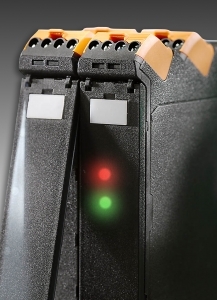 The individual colour scheme in the connection sections unambiguously allocates the respective function, for example ATEX or safety switching circuits and so forth. The optional PE (protective earth = earthing contact) and FE contacts (functional earth = shield contact) to the mounting rail extend the range of applications. The new housing series opens up the greatest possible number of applications and design freedom for device manufacturers. Every square millimetre of the 7400mm2 PCB can be utilised without any restrictions. Electronics production has also been designed for efficiency, for example automatic placement of the pin headers. The 6mm housing has been designed for the future-orientated THR reflow soldering process. As well as conventional wave soldering the 22.5mm housing also facilitates pure SMT designs. During assembly the left and right-hand pin headers are processed with the PCB in all soldering processes. The side panels are simply pushed upwards, the head assembly (head, hinged lid) is subsequently precision mounted. The base of the housing system reliably interlocks each element and secures the complete unit, preventing unintentional disassembly. Providing a generous amount of space to implement operating and display elements as well as interfaces a large, fixed-position front plate offers freedom for individual design solutions. The transparent, hinged lid above the front plate protects the operating and display elements and in so doing contributes towards operational reliability; it can accommodate device markers, be printed and even sealed. All joint edges of the housing elements are designed with sufficient overlapping to ensure an ESD safe design; clearance and creepage distances have been optimised. During the development of its CH20M housing series Weidmüller placed a great deal of value on high-levels of user convenience and user safety. This fact is demonstrated down to the last detail. For instance, the user can benefit from the advantages of a pluggable connection technology. The socket blocks have been designed with clamping yoke (screw) connection technology. 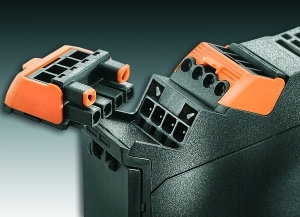 The clamping yoke connection produces a gas-tight, vibration and shockproof connection to the connected conductor. The high contact force offers peace of mind. The wire insertion facility Wire-Guard integrated in the connection system ensures error-free installation. No tools are required to operate the plus-minus screw. The plug-in socket blocks are equipped with a stable release frame. 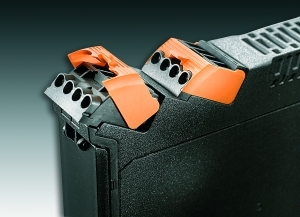 Its easy-to-handle finger grip also provides a screwdriver clip and thus ensures that ejection of the plug connector is reliable and precise - an advantage when working with densely packed modules. That ensures service and maintenance work can be carried out quickly and reliably - without damage to the connection technology. The integrated release lever avoids non-permissible pulling on the cable. The integrated, captive coding of the connection system with various coding options stands for maximum levels of safety during installation and commissioning procedures. When being installed for the first time the so-called 'autoset' coding is implemented, which means the code setting of the plugs is automatically transferred from the plugs to the pin headers in the housing. Protection against accidental touch designed into SHL pin headers and BHZ female connectors offer users high levels of safety; an inverted version for outputs is no longer required. And not least of all, a leading pin in the pin header facilitates safe separation of the connection. What are leakage and diffusion? All housing parts of the CH20M modular electronics housing system can be inscribed per laser for durable marking solutions. That facilitates permanent availability of wide-area equipment markings, circuit and connection diagrams. That in turn aids fast and reliable maintenance and servicing as well troubleshooting procedures. The CH20M offers the manufacturer the advantage that the housing can be tailored exactly to suit his application and not the other way round.